If you have been, or are, the parent of an aging pet, you know the joys and sorrows that accompany this experience. They have been by your side for so much. It’s important to understand the changes that occur and needs of pets as they age, so that we can provide them with the same unwavering love and support they have given to us. Exactly when a pet is considered a senior varies, not only by the type of pet, but size as well. For dogs and cats, signs of advancing age may remind us of our own as humans. They move more slowly, develop grey “hair”, and have difficulty doing things they once did with ease. There are also other age-related issues that may not be quite as obvious. Parents should be mindful for changes in eating and drinking, eliminating, weight and sleeping patterns. In addition, as cancer is not uncommon in our longer living pets, being watchful for unusual changes in skin and body, including lumps, is also important. Fortunately, pet owners do not have to navigate this stage alone. Our area has many loving, well trained professionals to help. Keep in close contact with your veterinarian. Checkups, screenings and regular exams are more important than ever. There are also great options for helping your pet live the best life they can as they age, such as therapeutic exercise and massage. As owners, we often like to get an idea of how old our pets are by comparing their age to ours. You’ve probably even heard the commonly quoted age calculation that one dog year is equal to seven of a human. This is not very accurate, however, as it doesn’t take the animal’s size and breed into account. Large and small dogs, for example, do not “age” at equal rates. 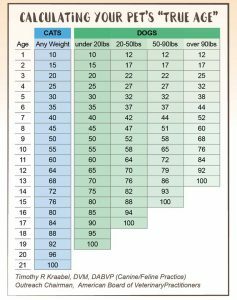 This chart provides a rough calculation of a dog or cat’s “true age”. Regardless of the stage of life your beloved pet is in, there is no doubt that your life will be better for having shared it with them. Be sure to enjoy each and every day. No matter how long we have them with us, it is never long enough.